Image by George Eastman House via FlickrCrazy days. Peek into the window of my classroom a moment. It is easy to think that other teachers are super organized or super-something -- when really teaching is really busy business. Today, we started the stock market game in my ninth grade class. We've spent the last two days learning about stocks as part of a spreadsheet model we're doing. In addition to buying and selling stocks, we've set up spreadsheets pulling live data from the web as they track and write reports on their stocks. "I want you to know more than how to do formulas in spreadsheets but to be analysts," I said today. "But Mrs. Vicki, you have to tell us how to make money in the stock market and what to buy," they exclaimed! "No, I don't. In fact, if I knew that I'd probably be at home trading on the stock market." And thus, launched a whole conversation about the realities of life and the fact that often there aren't "answers" but rather "journeys" of learning and also people who are good at things and those who have other talents. "But how can I make money in the stock market if you don't tell me how to do it," said another. "Buy low and sell high," I said with a lopsided grin. Then, we discussed a conversation about understanding trends. Ah, ha - I think they understand now why I talk about wanting them to understand change and how to predict it. We're finishing up our films for the Flat Classroom project in tenth grade. One of the parents on the bus to the state game said their child was checking the Flat Classroom ning while traveling on the team bus to the state football game to see if his outsourced clip had been delivered to him. "Awww dad, you ruined my voiceover! I'm going to have to start putting a sign on my door when I'm working on my film!" as someone films or records for a brief moment. We've had some wiki problems lately and so we're working on making sure all of the holders for the video are ready to receive them. Others complained because a student from another school used copyrighted music on their video and I don't let mine - so a quick message and reminder to the other teachers that according to the Digital Millenium Copyright Act that often we can receive takedown notices and have to comply. We want our kids' videos to stay put! My eighth grade keyboarding class is finishing up their porfolio due next week and today I had kids filming their keyboarding "instruction" video (I start the new semester showing last semester's instructions for how to type) while others were polishing up their photo essay, writing blog posts, tweaking MLA papers and printing out their Toondoo explaining the difference between Web 1.0 and Web 2.0. Additionally, I leave the Ning chat up for this class as they use the backchannel very well to help one another and ask me questions. I've found it to be useful when we are in the final days of projects such as this when information needs to flow rapidly and we become a sort of search engine for "how to" information for one another. Accounting is another story. I teach debits and credits by hand because I think that is the best way to truly cement the learning of HOW accounting works into their minds. I'm prepping them for a simulation that takes about 5 days. They will journal, record, and produce financial statements for a business for 30 days worth of transactions. It is open notes and open book but closed teacher and closed "friend" but I've found that those who've resisted my accounting wiles end up learning accounting anyway by the time they are done. Today I had to clean up all of the lighting equipment and have to remember tomorrow to go take down the fabric we were using as our chroma key (green screen) on the side of the stage. At 11:00 am - a whole 2 hours early-- 500 poinsettias were delivered for my National Honor Society to deliver all over town and with the threat of rain and a tornado watch, I had to cut my accounting test in half so I could get my students out there to help us with the poinsettias. At the same time, the huge box of stationary that was sold by our students going to China was delivered! Throw on top of it our assembly for winning STATE (13-0 - WAY TO GO) in football this year and the city showing up unannounced to install a super new higher speed modem! Whew! I just got off elluminate with my dear friend Julie Lindsay as we continue to work on our book deadlines for the Flat Classroom project, plan the conference in February, and work on meeting the needs of teachers for Digiteen and look ahead at the Net Gen project in the spring. Yet, I wouldn't trade it for anything. I'm busy. So busy. Working very hard. Doing what I love. Being with people I love. Tomorrow I'll jump on a plane after school to zip to Louisiana to spend time with my friends at LACUE and then be back by 10:30 pm Thursday night. Next week I'll do the same heading to Memphis, Tennessee for the Mid-South Technology conference. Really, as I look at the craziness of these days these are really blessed days. You know, what could be worse than being bored? Yes, I'm tired and ready for Christmas break. I've got presents to wrap and food to cook, and yet, somehow in the midst of this craziness this is fun. The only thing is that I want to make sure I spend time on what is the most important: relationships. Thank you for the opportunity to share with you the craziness of these days. Also, for those who think teaching is just sitting in a chair all day and grading papers - think again. It was funny to see how many teachers dm'ed me today on Twitter when I shared some of the nuttiness about how busy and crazy it is to teach. I'm sure that each one of you could share a super-crazy day just like this. 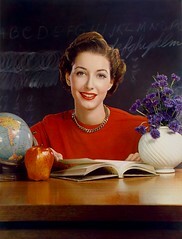 Teaching, my friends, is the most noble calling on earth (next to parenting.) Never forget it. Retain your nobility. Nobility begins and ends with how you act - how you treat others - how you remain professional. You are noble. Remember it. Be it. Do it. And never forget when you so so hugely busy that sometimes eye contact and a kind word from you can mean more to your students than anything else you could do! Darren Fix has a cool middle school science blog at www.sciencefix.com. This is an example of how many niche teaching blogs are cropping up for just about any subject area. I have been a science teacher for 14 years. Currently I am teaching 7th and 8th grade science at Spring View Middle School, in Rocklin, Ca. I am also the lead technology teacher and I have a masters in education technology via the iMET masters program at California State University, Sacramento. I am a science and technology nerd who thoroughly enjoys teaching. I love to do demonstrations of science concepts and I also try to incorporate the latest discoveries in science into the classroom. I also integrate computer applications into the science curriculum to further enhance the learning experience. I think this is a nice blog for middle school science teachers. I'm going to work to find some more different teacher blogs as that is part of my own personal mission here: to encourage and advocate for teachers in the classroom who are doing really cool things to reach students. Feel free to share your favorite science blog from classroom teachers in the comments here so that those looking for them can find them! So, head out and get your science fix! For those of you who follow these projects and may want to participate. Here are the upcoming deadlines for applications. If you apply - watch your email because part of the acceptance process is to see that you are responsive and involved - otherwise you're not ready for this yet. More information about the March-June 2011 project coming soon! Statistics on how our students are using technology. Over 54% text daily. We wonder why we feel frustrated and upset all of the time? Perhaps it is because over half of US workers check email while "off." Can we have thanksgiving when our nose is in our work? Why can't we just leave it behind? Delivering Educational Content to "that Second Screen"
I've been reading about the "second screen experience" in mainstream media. This is where one can watch the show on there television and chat or communicate on their handheld device like an iTouch, cell phone, iPad, etc. I know that I've done this before while watching a voting show like American Idol to "see" what people are saying as I follow the hashtag or search. But it is moving mainstream with websites like HBO (used a Twitter microsite to connect True Blood fans), the 2009 Miss Universe pageant, and TiVo releasing an app to make the iPad a second screen experience. In fact, if we look at the teens and what they do EVERY day they are texting and using their cell phones. With Smartphones front and center in some research (more research needs to be done by NON-cell phone companies one might add) these handhelds are going to be increasingly important. Companies like Discovery are already syndicating content over iphone / iTouch apps but really the second screen experience needs to be looked at more closely. The fact is we can't really pay attention to more than one thing at a time. Right now, our backchannel chat is down for Digiteen and Flat Classroom. We found it was great for getting acquainted with partners, but once we got into the heavy work that it was a distraction. That being said, there is something for combining immediate assessment while the viewing experience pauses or event to poll students and through electronic wizardry include their answers in the viewing experience and perhaps even let them determine the next segment watched. What if students could text in their questions to the teacher as they are watching or could also hit a button when they are especially unengaged or confused. What would that do to the experience? DVD and Video have barely made it into the textbook companies' arsenal of learning experience and we need apps and other innovations as well. What is evident to me is that these innovations will either be made by the textbook companies or the more likely - cell phone companies and other innovators in the mobile device market will create some really cool apps and eventually be purchased by big textbook companies. Maybe one or two lucky ones will become a "content delivery" company of their own. What happened to the music industry is rapidly gaining on the knowledge industries like publishing companies. It will affect us all. I think it is vital to be part of the innovations, testing, and learning experience as being part of the pilots and innovations is going to be important for our students and their future. I think wise people everywhere are definitely realizing that we can do better than the paper textbooks that hit our dumpsters and recycle bins every three years. Now with second screen experiences and educational apps become hot topics as well as educational video games gaining traction, we're about to see some really interesting things happen. After these things happen, I think some amazing augmented reality apps will be close behind. Just keep an open mind, speak out and let your voice be heard. Teachers and educators have a great opportunity to shape and be part of change. You can be part of change or a victim of change. That is pretty much it. As for me, I'm learning and listening to all of you out there. There are some amazing innovators in the classroom and on the speaking circuits around the country. As you think of your blessings, reflect upon the affect you can have upon others if you share, encourage, and use your God given talents to bless others. Today the spotlight is on some of you and eight principles for being Thank-full in your life. Life is like nothing else -- the more you give of your life - the more you receive. The more you share - the more you receive. So, be thank-full by sharing thanks. Heidi Chaves said hello at ISTE this summer and as she stared her story she inspired me and gave me purpose. Heidi started using the Couch 2 5K app after reading about it here and also shared it with her family. "It was a honor to meet you at ISTE. Hope you will remember that we spoke about how you have been an inspiration to me not only with your boundless energy for student learning but also your CP25K in 2009. 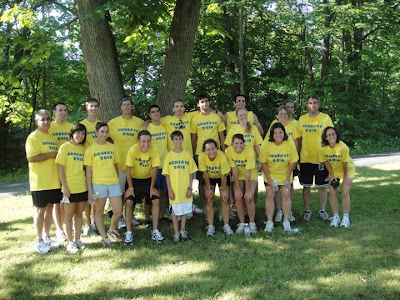 I organized our family and we had our very own 5K on July 31st near Honeoye, NY with 20 runners. I was the oldest participant and our youngest (age 11) was our winner. I wasn’t anywhere near the front but I’m pretty sure the second and third placers made sure he was the winner. It was a wonderful experience of young to old sharing planning, training and running. We used email, texting, a Google Spreadsheet, Robert Ullery’s podcasts and GPS tools. I guess you could call it project learning. Thanks for getting me off the couch. Hope you enjoy this picture. (I’m second from the right in the front row.)" "Me?! On your blog?! I'd be thrilled. I guess I'd like to add that the winning time was 23 minutes just so everyone knows we were "serious". And that since most of them agreed to do it just to support me, I had tears in MY eyes when I saw all the yellow shirts stringing out down the road in front of me. So happy that I could pay back some of that inspiration that you've given me. Oh, and as I reread my original email, we also used digital cameras, jumpdrive, netbook and of course Facebook!" This is such a story of how things happen nowadays. We share and learn and then another takes it and multiplies it far past what we can imagine. Heidi deserves all of the credit for getting her family running but to know that in sharing - that it would just facilitate a beginning that means something. Look at all the family members who did this for her! She has a whole team of people encouraging her! Thank-Full Principle #1 - Share. Share with others generously and feel free to share your story -it may motivate others who identify with your struggle. Thank people when they've influenced you for positive change. Sometimes you're just the encouragement they need to keep sharing! Thank-Full Principle #3 - Move. Get outside and move your body physically. You'll feel better and the endorphins your body will release will make you feel better. It helps you to be more thank-full. Brad Wilson (@dreambition) a teacher from Michigan was the winner of the VSP Visioncare Ipad Giveaway that we had back in October. He sent me these pictures of his class. Because Brad took the time to enter a contest here on this blog - he is blessed with a new iPad and I'm blessed by these photos of him with it. 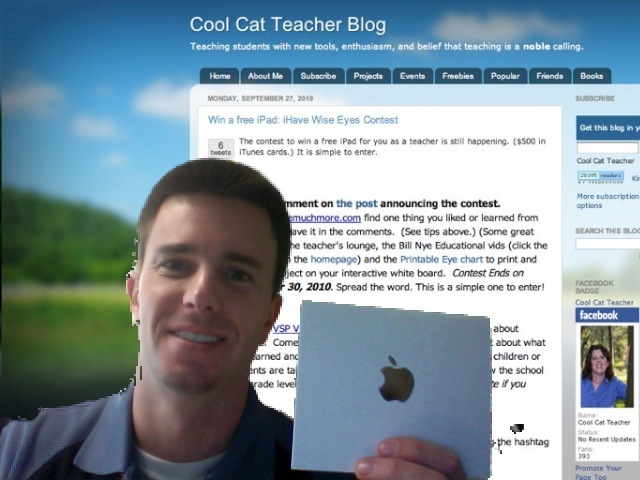 ""I really want to thank the Cool Cat Teacher Blog and VSP Vision Care for teaming up on this contest. I have been reading the blog for almost 3 years now and your wisdom, experiences & links have enriched my own learning in so many ways. My classroom teaching practice has been shaped by you and many others in my PLN, and adding this new tool to the mix will continue to stretch the boundaries of what learning looks like. The 4th grade students at Stewart Elementary in Stevensville, MI are thrilled to get their hands on an iPad and I am excited for them to perhaps be the biggest advocates for more technology-enriched learning opportunities in our community. THANK YOU!!!! ps- My students are just beginning their blogging journeys and have posted some content from Glogster and Voicethread- they would love to get some feedback from a global audience!"" Brad didn't know this but part of me was wondering if the effort required to "run" a giveaway was worth it. Did people think it detracted from my blog? Did the energy it took take away from other things. Should I do another give away? Because of his letter, I've decided that I will do it again. If some of you can be blessed through it - then OK - let's go. (So, December 13-17 I'll be giving away a m90z computer from Lenovo. It is my prayer that enough encouragement and sharing happens here to give you something in that way. See the video of when he used the iPad in his classroom. Thank-Full Principle #4: Tell Your Story. We may look at trends and big numbers, however, it is the stories that motivate us. A number is a number - often faceless. A story is a human being. A person. Whether your story is about something you've found or someone who helped you find it, they are powerful. Many teachers could care less what percentage of teachers are using wikis - but if they hear the story of one person who is using it successfully - that is often what changes everything. Some teachers would have taken this iPad home and hoarded it. Brad took it to school. He shared it with his students. He is receiving blessings and excitement as he innovates with his students. The easiest way to become unhappy is to be self-focused. For example, Jerry Blumengarten (@cybraryman1 on Twitter) has tweeted encouragement me to me as I run and struggle. There have been many days I wanted to quit but cybraryman1 wouldn't let me! He was there for me! He looked past himself and even past the persona of "cool cat teacher" to see a real person who has been struggling with getting healthy after 40. He influenced me to keep running and I can influence others as well. Focus on others to serve and encourage them if you want to be a happier and more thank-full person. Brad asked if you'd comment on his kids' blogs. So, do it! Most of you have salt and pepper on your Thanksgiving table. Two very different spices and yet they are together. Families are odd mixes of people (some say proof that God has a sense of humor) and it is often that odd mix of right and left brainers -- tall, short, loud, quiet, -- the salt and pepper that makes food taste better and life more interesting. These two teachers used a ton of different tools - one to motivate her family and the other to motivate his students. Some people look for ONE answer but in reality there are often many. Thank-Full Principle #6: Appreciate Diversity. Appreciate a diversity of people, tools, and methods to accomplish your goals. You'll find that often it is the diversity that helps you reach more people. The other thing that strikes me is the heart I see in these two educators. They each put their heart into what they are doing. Your school can pay you to be in a seat - but only you can employ your own soul. Only you can harness the power of your heart for making your world a better place. Harness Your Heart to improve your world, your classroom, your family. A heart harnessed for a purpose can break through the toughest, most impermeable ground of problems that seem too hard to plow under. Persist in the things that are worth doing. One one more note, the iPad give away almost didn't happen. Jennifer Kutz (Lewis PR Global), the organizer of the iPad Give away had quite a bit of persistence because of my crazy travel schedule in October. I love working with people like her who understand win-win scenarios but also know that sometimes people aren't ignoring you - they are just busy. Adults reach a point where we give up. So many of us give up just before winning. What if Thomas Edison said he'd fail 98 times and then quit? We wouldn't have the light bulb. Persist in the things worth doing. This blog is still here because I KEEP BLOGGING. If something is worth doing well it is worth doing poorly until you can do it well. Persistence breeds success. Never never quit as Winston Churchill said. When you persist and accomplish then you are truly thank-full as your life brims with blessings. You are a blessing, my friends. Now, push back from the computer and go be thank-full! "Penguin Classics On Air online radio broadcast covering BANNED and CHALLENGED books, which you can listen to here: http://penguin.com/pconair. This 20 minute broadcast is broken up into easily digestible 6 minute sections and covers banned or challenged classics old (Huckleberry Finn) and new (Harry Potter). The show also features interviews from librarian extraordinaire and BOOK CRUSH author Nancy Pearl as well as author Rick Wartzman and would surely make an excellent multimedia supplement to any lesson plan on banned books or freedom of speech. " Cool new Learning Game from Microsoft that Kicks off TODAY! "During the first Thanksgiving NFL game, over 300 students will be playing the newly launched game InterroBANG, which you can follow live at www.interrobang.com. This educational game is now available for teachers/students through June 2011. Teams can play and compete for great prizes, including Xbox Kinect." It is great to see organizations support educational gaming. Let's make learning fun! Some advice to new teachers that I shared over on success in the classroom's blog. It is tough to raise money these days as I know from working to find scholarships for students to the Flat Classroom Conference. This is from Ford Focus and I wanted to share with those who are also raising money for their organization. "What’s in it for those Submitting Videos? Selected participants, along with a friend, will get a free trip to Madrid, Spain on February 18-20th to test drive the all-new Ford Focus. Additionally, Ford will make a $10,000 contribution to the qualified charity of the participant's choice. What Should the Video Include? I am happy to help answers questions you may have about the program dymanics and look forward to speaking with you. All the details can be found by clicking here (you'll be prompted to like the page in order to learn about the campaign, see the video explaining it, review current entries, etc.)" Lots of math games for your interactive whiteboard. Last Tuesday was my husband's birthday. I always write a post to dedicate to him. I found this old poem in my journal penned on the last day of Spring break this year that really fits with what I'm feeling these days and I dedicate it to the most amazing man on this planet (in my eyes), Kip Davis! It is an appropriate Thanksgiving post. Disheveled hair. Tossed by swirling wind off the bay. The first boat out of the harbor today. Quiet spray kicked off the street below- washing away last night's goings on. A fresh wind in my mind. a white wake drifting behind. wondering if what I do is best. I can check email anywhere. This day won't last and my email will keep. Sad life. Stuck in a room. perusing through the lives of others. here alone watching my son swim. seeing the joy of him. as they text on their cell phones. now it is the blackberries. Clarity is needed to see my life. "Mom, can you watch me?" my son says. I met Brad Edwards and asked him to share his program with us. This short film contest method is very effective! I love the Oscar cake on this website! We're starting the third year next month, culminating in May at the Oscars Night." "simplebooklet is a tool that lets anyone create little flipbooks. It's all WYSIWYG publishing, and it makes it very easy to publish your completed project across a number of channels (email, printer, social network, twitter, and more). " As many of us in North America plan to eat a bit this week - it is good to think of this program that asks youth to become activists against hunger. The contest is open until December 3rd, 2010 and will be judged on clarity of information, creativity and connection to topic. While everyone can participate, the 3 highest-scoring submissions will be profiled on the ACF website and will receive a Student Activist package." Build your own space mission game from the Jet Propulsion Laboratory at Cal Tech. There are tons of very cool games and tools on this website. If you're teaching about astronomy, space, or planets to any age, you should take a look. A website vocabulary building tool. There are so many ways to study vocabulary online. Shane Sullivan's blog about video games in the classroom called "Consoles in the Classroom." Thought that those of you who are interested in this hot topic may want to take a peek. I'm impressed with this glog sample and am now testing the glogster premium service. "immersive virtual academy for language learning as MiddWorld Online launches today. Aimed at K-12, students will be fully immersed in the language including “Passport City,” made up of fun extracurricular activities offering students additional opportunities to practice their target language. The highlight of “Passport City” is an innovative online 3D roleplay game, developed as a virtual world using authentic environments and cultural activities—bringing to life the experience of being in a foreign country. " Written by Tara Engel of OPPapers, here is her take on how such a website can be used in a positive way for learning. Of course, this assumes that schools have plagiarism checks in place and most of them I know of do not. Be aware. Free and premium essays, term papers and book reports are available. I received a letter from someone representing this company who said it wasn't plagiarism, however, let me point out. If you're not using something such as turnitin.com - you're just asking for kids to use this sort of website. Share this and discuss it. How can we ensure students are doing their own work? Often, the oral quiz and project based learning are great ways -- certainly not just paper writing but multiple modalities of assessment are essential! Just in my inbox. This is a cool website with tons of streaming educational videos organized by subject and grade level. each including learning comprehension questions"
Once again, it is time for the Sounding Board process for the latest Flat Classroom Project. This semester there are two concurrent Flat Classroom Projects so we need more Sounding Boards than ever! The Sounding Board process is a very easy, fun and eye-opening way for younger students (upper elementary, middle, and lower high school) to participate in one of these amazing, global projects. Basically Sounding Boards act as peer reviewers for the students participating in the project. Small groups of students in the Sounding Board classrooms will review one Flat Classroom student group’s work and offer very simple peer feedback. We are looking for as many classrooms as possible to join us in this quick and easy, but exciting project! Usually the time commitment for teachers and students is about 2 – 4 hours depending on the age group you’re working with. For upper elementary groups, they usually spend closer to 4 hours, for middle school groups, they usually take just around 3 hours. Our aim is to make it as simple and easy to participate as possible! We are looking for Sounding Board classrooms to participate in the review process during the last week of November 2010 and first week of December. Ideally there will be a teachers planning session in Elluminate as soon as we have enough classes signed up. If you’re interested, please join the Flat Classroom wiki and add your name to the either of the Sounding Board pages (linked above)! Please feel free to send any questions to Kim Cofino or to fcp@flatclassroom.org. Looking forward to working with another amazing group of teachers and students! There is a time to unblock Facebook. Tomorrow is one of them. History and a most admirable defense of democratic ideals has happened as Iranian Filmmaker Jafar Panahi delivered his defense last week in an Iranian court. He cross posted his words on his Facebook page and now these words have been reprinted in the New York Times and other locations. He divides his speech into two parts "what they say" and "what I say." This will definitely be assigned reading for a blog post in my eighth grade class early next week, aptly, the week of Thanksgiving. He was arrested earlier this year while 30% through filming something that a local paper called "an anti-state film" and was held for three months of detention without trial in Evin prison in Tehran. He held a hunger strike and was released on $200,000 bond in May of this year. Perhaps if we want students to understand freedom and the price that is paid where freedom of speech does not exist, he is a great, albeit sad, case study. I would like to remind the court of yet an other ironic fact about my imprisonment: the space given to Jafar Panahi's festival awards in Tehran's Museum of Cinema is much larger than his cell in prison. I declare that I believe in the right of 'the other' to be different, I believe in mutual understanding and respect, as well as in tolerance; the tolerance that forbid me from judgment and hatred. I don't hate anybody, not even my interrogators." Please read the entire speech it is poignant, moving, and also serves to cause one introspection on the love one has for their own country. "What price do people pay for love of their country besides that of serving in a war? Do citizens pay a price? What happens when citizens are no longer willing to pay a price for the love of their country?" I'll be thinking on this but I'd love to ask you. After reading the speech, what questions would you ask students? What thoughts does his speech evoke in you? Great countries, communities, and schools have people willing to pay the price to make them great. Our time. Our energy. Our creativity. Our very lives are spent watering the ground upon the living ecosystems of this world that we cherish. Where we spend our lives and our time, we see growth. Whatever we sow we also reap! Sometimes I think many of us have forgotten the price paid. Many countries emerged from war with a lot of back-breaking work to do. Tough times call for tough work. With India now teetering on a crisis due to their microloan problems and some talk of Euro instability and California continuing on budget shortfalls four of the most recent six articles delivered to my Kindle tonight were about economic instability what the world needs right now is rock solid determination and stability of purpose of those citizens who know that if our grandfathers and grandmothers can do this, then we can too. There is a temptation to whine. There is a tempation to have pity. Last I checked, if I'm on this computer and you're on yours then it is doubtful we are wandering the streets homeless as did many of our ancestors during the great Depression. And yet, here we have an Iranian filmmaker who loves his country and is willing to pay for it with his own life by staying and being there and speaking as much as he can about injustice. He's willing to put his life where is mouth is. That, my friends is what we need. We need people who are willing to put their life where their mouth is. Talk Talk Talk - we need Work Work Work. We have schools to build, students to reach, and have to creatively work on ways to educate our young while being fiscally responsible. It is going to require hard work. With Purposeful Work Often Comes Peace. And yet, some of the best sleep of my life has come after final exams, book deadlines, exhausting conference schedules, end of semesters. When I've spent it all for a good cause, somehow I look in my pockets and find them bursting with more. We need men and women of character in these times. Those willing to pay the price for love of their country, their school, their professions. There's a lot of work to do. I find myself inspired, of all people, by an Iranian filmmaker. What an amazing world in which we live where information flows so readily. The question is, do we take information and turn it into actions? Do we pay the price like Jafar does or do we sit back as casual observers watching the world spin into confusion when we could do our part to steady at least the corner in which we work. Remember your noble calling, teacher. And take some time to discuss the nobility among us as Jafar seems to be. Adobe is giving away a copy of the Adobe eLearning Suite (a $1,799US value!) to the educator who submits the highest rated eLearning and Collaboration resource on the Adobe Education Exchange during the month of November! When you join the Adobe Education Exchange before November 30, you also are automatically entered to win a copy of the Adobe Creative Suite 5 Master Collection software (a $2,499US value!). Important article about bullying by social media researcher-expert Danah Boyd that is right on the money. This is why I believe that projects like Digiteen where the kids research and talk and propose actions are so much more meaningful than these "assemblies" and "speeches" that are just fodder for humor and teenage satire. I have been remiss in posting the Flat Classroom events and times for the Global Education conference but Julie Lindsay has collected all of the remaining live events for Thursday and Friday. Thanks Julie! If you want to hear from students or just a few of our teachers (many have already presented) please do! Have a great conference day! The following are teachers and supporters of Flat Classroom and we encourage you to attend their sessions! Thursday November 18 and Friday November 19!! "TITLE: ANSER Got Rights PRESENTER: Jackie Gerstein, ANSER Charter School (USA) ELLUMINATE SESSION ROOM (open one hour before session): https://sas.elluminate.com/d.jnlp?sid=gec2010&password=D.3D169A3ACEB579B1F02A2663A80AC6 FORMAT: Panel LANGUAGE: English SHORT DESCRIPTION: The ANSER Junior High Students will present the Human Rights celebration we held. Groups of students studied and presented individual rights from the Universal Declaration of Human Rights. We connected the rights with the real world, our community, and ended with a Human Rights celebration at a local park. Our work and media from our performance can be found at http://anser.weebly.com/index.html . We will review these during our presentation. 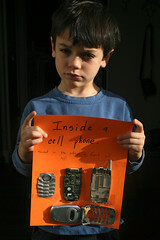 WEBSITE: http://anser.weebly.com/index.html TRACK: Student"
Thursday 1am GMTTITLE: ProjectGI - Peace Education & Technology PRESENTER: A.J. Juliani, Wissahickon High School and Project: Global Inform (USA) ELLUMINATE SESSION ROOM (open one hour before session): https://sas.elluminate.com/d.jnlp?sid=gec2010&password=D.886DB8156F18EA5417AA9B921FC8CD FORMAT: Presentation LANGUAGE: English SHORT DESCRIPTION: Project: Global Inform (PGI) is an in-school project where students use technology and social media to spread awareness about human rights violations. PGI came out of the idea that we too often “teach” our students about genocide and human rights violations, but never “do” anything about it. This project’s main objective is to create awareness about current human rights violations in our schools, communities, and abroad. PGI was piloted at Wissahickon High School in 2009 and 2010, and is currently expanding to a global project this year. This presentation will take you through the process from start to finish! WEBSITE: http://project-inform.org/ TRACK: Global Issues"
TITLE: Inside ITGS: Cyber-Students Share their Connected Learning PRESENTER: Julie Lindsay, Beijing (BISS) International School (China) CO-PRESENTER(S): Madeleine Brookes / Students from China ELLUMINATE SESSION ROOM (open one hour before session): https://sas.elluminate.com/d.jnlp?sid=gec2010&password=D.363ECFBB6A8B7916D058A55F05F499 FORMAT: Presentation LANGUAGE: English SHORT DESCRIPTION: Inside ITGS is a collaboration that started between two schools in China. The aim of Inside ITGS is to join students together in a flattened virtual learning environment thereby providing enhanced opportunities for cultural awareness and global collaboration as well as explore and evaluate IT tools and systems in an authentic and social context. Join Grade 11 Information Technology in a Global Society students from Beijing (BISS) International School and Western Academy Beijing as they present and discuss about what it means to be a connected and collaborative online learner with the ‘Inside ITGS’ community. Topics covered include best tools to support online learning, global digital citizenship perspectives, and challenges to connected learning in a global sense. WEBSITE: http://insideitgs.net http://inside itgs.ning.com http://insideitgs.wikispaces.com SPONSORING PARTNER: Flat Classroom Project TRACK: Student"
TITLE: Constructing Knowledge and Solving Problems for a Global Education. PRESENTER: Kevin Crouch, The American School of Bombay (India) ELLUMINATE SESSION ROOM (open one hour before session): https://sas.elluminate.com/d.jnlp?sid=gec2010&password=D.A9E2ECF67939F27439FBB91EE8E84B FORMAT: Presentation LANGUAGE: English SHORT DESCRIPTION: This presentation will focus on how collaborative productivity tools such as Google Apps in conjunction with social-constructivist tools such as Voicethread can be used together to provide a convenient center of learning for activities supporting a global education. Students can plan inquiry, collect data, discuss results, and present findings collaboratively and asynchronously from any part of the world. Furthermore, all the activities can be embedded and monitored in a central location. TRACK: Teacher"
TITLE: Flat Classroom Project Student Summit PRESENTER: Honor Moorman, The International School of the Americas (USA) CO-PRESENTER(S): Cassie Allen / ""21st-Century Global Leadership"" students ELLUMINATE SESSION ROOM (open one hour before session): https://sas.elluminate.com/d.jnlp?sid=gec2010&password=D.616EBAB340DECDBA972DC1EEE5B1A1 FORMAT: Presentation LANGUAGE: English SHORT DESCRIPTION: Secondary students from The International School of the Americas in San Antonio, Texas, USA are participating in the Flat Classroom Project as an integral part of their ""21st-Century Global Leadership"" class. In this session, they will share what they've learned about the technology trends described by Thomas Friedman as ""flatteners"" in his book, The World is Flat. Students will also reflect on what they've learned about collaboration and communication through their participation in this global project. The students are leading the way; join us to hear what they have to say about global education! WEBSITE: http://21globalleadership.wikispaces.com/ SPONSORING PARTNER: Flat Classroom Project TRACK: Student"
TITLE: Global Issues Project PRESENTER: Ray Jones, Qatar Academy, Doha, Qatar (State of Qatar) ELLUMINATE SESSION ROOM (open one hour before session): https://sas.elluminate.com/d.jnlp?sid=gec2010&password=D.0CA5AEB5339630F888FC96A3B86999 FORMAT: Presentation LANGUAGE: English SHORT DESCRIPTION: Workshop Title: Global Issues Project: Creating a Community of Connected and Collaborative Learners. Targeted Audience: Middle Grades/High School. Description: For this online workshop, educators will be given an overview of the online project and how they can apply concepts of creating a community of connected and collaborative learners in their classroom and beyond. Various Web 2.0 applications will be explored among them wikis, Ning, etherpad and Google apps. Current action research, school collaborations, NETS standards, IB MYP curriculum connections will also be highlighted. This workshop will be immersive, interactive and educators will come away with an action plan, as well as learn how to become part of the Global Issues Project. WEBSITE: 20globalissues.wikispaces.com TRACK: Teacher"
"KEYNOTE SPEAKER: Vicki Davis ORGANIZATION: Flat Classroom Project™ (http://www.flatclassroomproject.net/) ELLUMINATE SESSION ROOM: https://sas.elluminate.com/d.jnlp?sid=gec2010&password=D.649349FB46AF2BA93D6B248D5BAD49 PRESENTATION: Flatten Your Classroom: Move to Global Collaboration One Step at a Time. 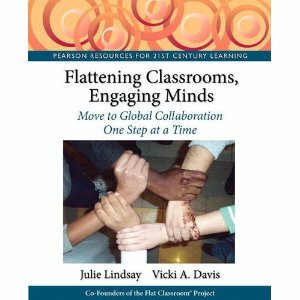 Global collaboration can seem daunting to many Vicki Davis and Julie Lindsay, co founders of the Flat Classroom projects (including Flat Classroom, Digiteen, NetGenEd, and Eracism projects) have created a series of steps for connecting and flattening the classroom on a global basis providing a simple progression for teachers and schools to globalize their work. Join Vicki for a lively conversation about the steps to globalize and share your own experience in the backchannel. TRACK: Teacher BIO: Vicki Davis is a teacher and the IT director at Westwood Schools in Camilla, Georgia. Vicki co-created four award winning international wiki-centric projects, the Flat Classroom™ project, the NetGenEd™ Project, the Eracism Project™, the Horizon project, and Digiteen™ with teacher Julie Lindsay, currently in Bejing. She is cofounder of the Flat Classroom Conference to be held in Beijing, China in February 2010. These projects have linked more than 2800 students from both public and private schools in such countries as Austria, Australia, Bangladesh, Canada, China, Germany, Japan, New Zealand, Oman, Saudi Arabia, Spain, Qatar, Pakistan, Romania, and the USA. These collaborative projects harnessing the most powerful Web 2.0 tools available including plns, wikis, blogs, digital storytelling, podcasts, social bookmarking, OpenSim Virtual worlds and more. Vicki has been featured in various media including Thomas Friedman's book, The World is Flat, Don Tapscott's Grown Up Digital, the Wall Street Journal, and the Boston Globe and more. 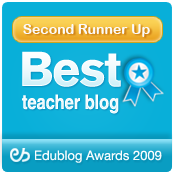 Vicki blogs at the Cool Cat Teacher blog which won the 2008 Edublog Award for Best Teacher Blog and other awards. She was named a pioneer in Open Source Virtual World Technology in October 2009. Vicki is a Google Certified Teacher and Discovery S.T.A.R. Educator. 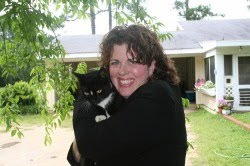 Vicki is also a writer and conference presenter. She lives in Camilla, Georgia where she is a full time high school teacher, wife, and mother of three." TITLE: 21st Century Literacy and Global Competence Flourish in the Flat Classroom™ Project PRESENTER: Honor Moorman, The International School of the Americas (U.S.A.) CO-PRESENTER(S): Catherine M, Edward M, Emily J, and Scott B ELLUMINATE SESSION ROOM (open one hour before session): https://sas.elluminate.com/d.jnlp?sid=gec2010&password=D.38B4E258EAFFD9D9787327D1F355B6 FORMAT: Presentation LANGUAGE: English SHORT DESCRIPTION: This presentation will translate theory into practice by demonstrating how the Flat Classroom™ Project helps students develop 21st century literacies and global competencies. Student presenters will facilitate a guided tour of their digital footprints to showcase the knowledge and skills they gained by participating in the project. This student work will bring to life three key frameworks: the National Council of Teachers of English Definition of 21st Century Literacies, the Asia Society Partnership for Global Learning’s description of global competence, and the Flat Classroom™ Project seven steps pedagogy. Participants will learn about effective teaching strategies and tools for helping students communicate, collaborate, and co-create with international peers. WEBSITE: http://21globalleadership.wikispaces.com/ SPONSORING PARTNER: Asia Society Partnership for Global Learning and Flat Classroom™ Project TRACK: Curriculum"
I enjoyed talking to the delightful Prantika Das from India when I was in South Africa. This video shows me several things: 1) the evolutionary nature of innovation and 2) the power of putting handhelds in student's hands. There are great teachers doing amazing things throughout the world. This is part of an ongoing series of video conversations that I filmed while in Microsoft's Innovative Teacher Forum in Cape Town, South Africa. Next year is in Washington, DC so find out information for how to apply in your part of the world!